Transcription of a lecture given by Degrelle. He stayed loyal to NS after the war of course, so the narrative is from that perspective, which may interest, refresh, or infuriate you. 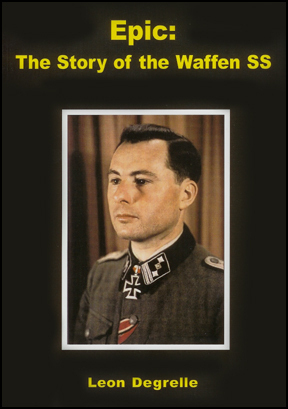 Interesting because Degrelle was in the thick of battle all over Europe and there is reason to hear his perspective. Leon Degrelle - Walloon politician, founder of the Walloon Autorian Catholic movement "Rex" and volunteer of the Waffen SSDegrelle was active as a journalist in Spain and rumours are that the comic strip character Tin-Tin was based on Degrelle ( Tin-Tin resembled Degrelle in appearance and in an early comic he was holding a newspaper, with the same name Degrelle had worked for )Degrelle was also active in the Belgian Catholic Party of which he splitoff in 1935 when he formed the Rex movement. After Belgium was defeated by Germany, Degrelle joined the Wehrmacht. In 1943 he and all the other Wallonians were transferred to the Waffen SS. The Wallonian Waffen SS fought at the Eastern front.After the war Degrell fled to Spain and was the head publisher for the group "Círculo Español de Amigos de Europa" Degrelle died in 1994 in a Spanish hospital.